This is a laser-cut, mirror stainless steel plate that bolts down to the top of your radiator shroud using factory hardware. This makes an excellent show item that is sure to turn heads. 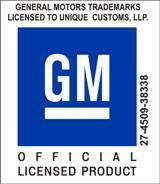 With this piece, you have the option to select a GM logo to be laser etched between the 2 bolts. Select from the list below and type in what logo you would like in the field. If you want logo #5, just type "logo #5" in the entry field. Our picture shows logo #2, for reference. Simply remove the 2 center 10mm bolts of your factory shroud, put this over the top, and then re-install the 2 bolts. We recommend using this only for show as water can enter this area due to GM placing the engine bay seal behind the shroud. With as simple as this piece is to install and remove, removing it for normal driving is hassle-free. Please be sure to check out our radiator shroud label (sold seperately) that copies the factory information onto a stainless piece. It complements the shroud cover nicely. If you want a more customized version, please shoot us an email and we'll work to get you what you want.